Oliver was born on May 16, 2353 in Starling City to his parents Robert and Moira Queen. When he was 7 years old, Oliver befriended Tommy Merlyn, who became his lifelong best friend, he also met and became friends with Laurel Lance around that time. When Robert was a pilot he performed his own maintenance, which Oliver sometimes helped with, gaining some skills in engineering as a result. At the age of seventeen Oliver, Laurel and Tommy all entered Starfleet Academy. Oliver elected to major in security instead of engineering. 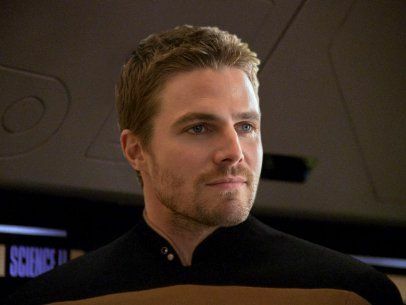 During his junior year Oliver was on the Uhat, a vessel equipped with slipstream drive that was sent to transport the crew of the Enterprise-D back to the Alpha Quadrant. Oliver was trapped on the Prometheus after an accident and was forced to finish his studies at the Academy in Prometheus' home universe without his girlfriend and best friend. His first assignment was on board the the Norway class USS Budapest. After almost five years on the Budapest Oliver was transferred to the newly commissioned USS Odyssey as the Assistant Security Chief.